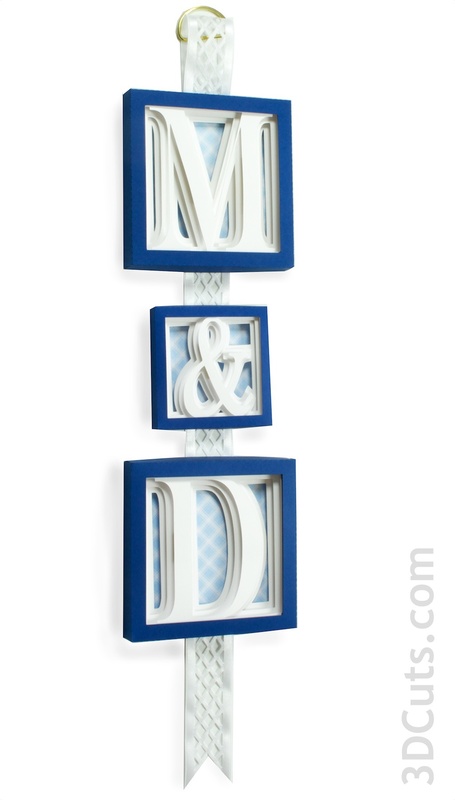 Take a group of letters and arrange them horizontally in a pre-made frame. Here I used a frame from Michael's. I glued a small print design paper to the backing and then glued the shadow boxes for HOME on top. Notice I used a heart shape for the O in the sample to the right. Shadow Box Shapes will be a future release. Link to cutting files for these projects here. New Granddaughter....new wall hanging using patterned paper. The Greek symbols that aren't part of the regular alphabet have been added as a group. There are 11 different files in this group for all your sorority and fraternity acquaintances. Pam McKithen has been hard at work again. This time she used the Alphabet Shadow Box letters in a large size to add decor for the room of a teen girls that loves to create. Look here for additional information on larger sizing for these popular files. I used the punctuation symbols from the shapes collection and assembled them out of classic 'tween colors. Perfect for your growing daughter's room. Notice the horizontal layout hanging from a rod. How about using a piece of driftwood? (Cutting files soon to be released). # ART is by Melody Lane. She has been creating video tutorials on making the shadow boxes here. 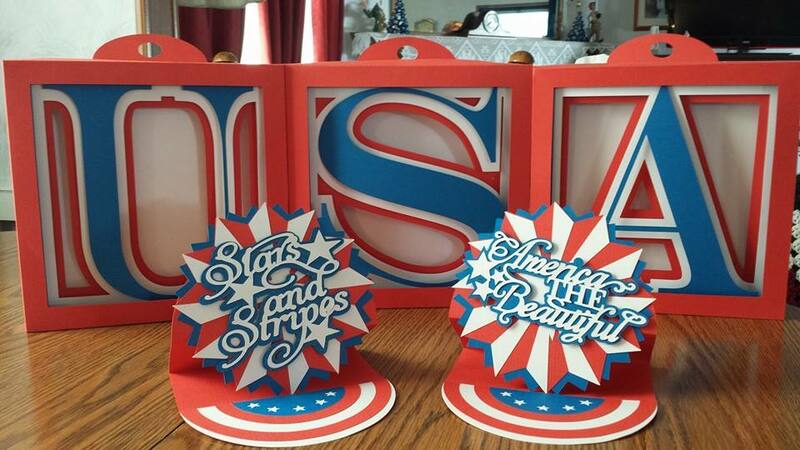 USA is a mantel display created by Geraldine Wolf. She combined my Alphabet Shadow Boxes with some other classic Cricut files for her arrangement. USA is a common theme this year with the World Cup excitement happening so close to our USA patriotic holidays. 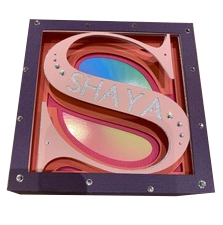 Her are the shadow box letters crafted by Pam McKithen using solid colors and different supporting files. Pam also worked with different paper combinations. I took the letters for my granddaughters' names and constructed them using paper colors that match their nursery rooms. I used hot glue to attach a 1 1/4" wide ribbon to the back and looped a gold shade pull or D-ring to the top. My grandson, now five, loves trucks. I created truck tire patterns in gray and printed those as some of the background papers for his name. I found some road-like ribbon to hot glue onto the back. To the right is a recent example that was shared on Facebook in the "Let's Learn Cricut Explore" Group. It was made by Karen Kirby. I love how she used gradated colors for the layers. And in the same Facebook post was this beautifully embellished A. There was no indication as to the artist. If you know who did this wonderful adaptation please let me know so I can give credit. Print all 26 letters and use them as room decor for a nursery or a classroom. Oh, the fun you can have with colors and patterns in this application! Consider attaching them abut 12" below the ceiling in one long line wrapping a corner. That would look terrific and be out of reach. Purchase the entire alphabet here. It is a great price for limited projects! 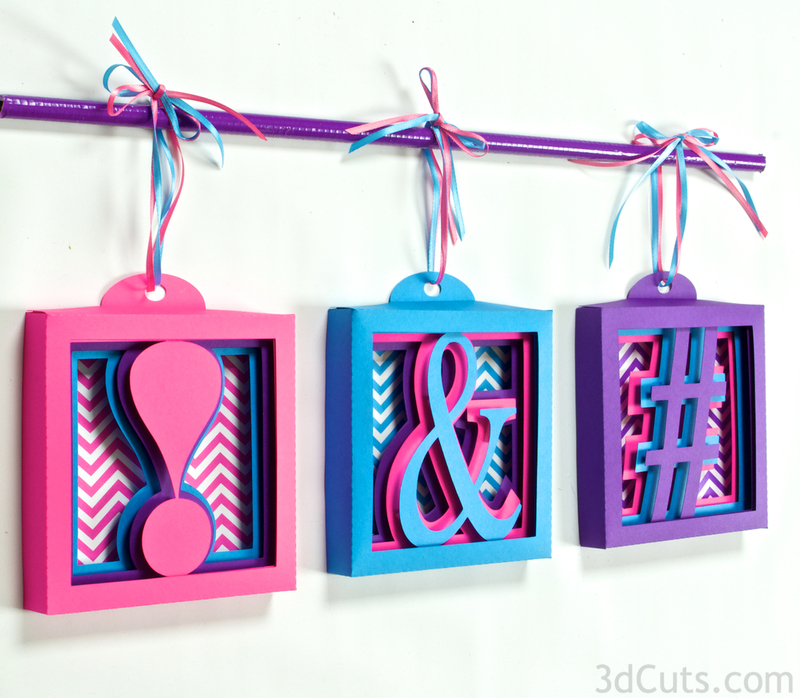 Resting onto a door or window frame is an excellent location for an Alphabet Shadow Box display. Cut and assemble the letters for an upbeat word like SMILE or PEACE, or consider your family's last name above the entrance door to your home. Do You Have an All-Star? 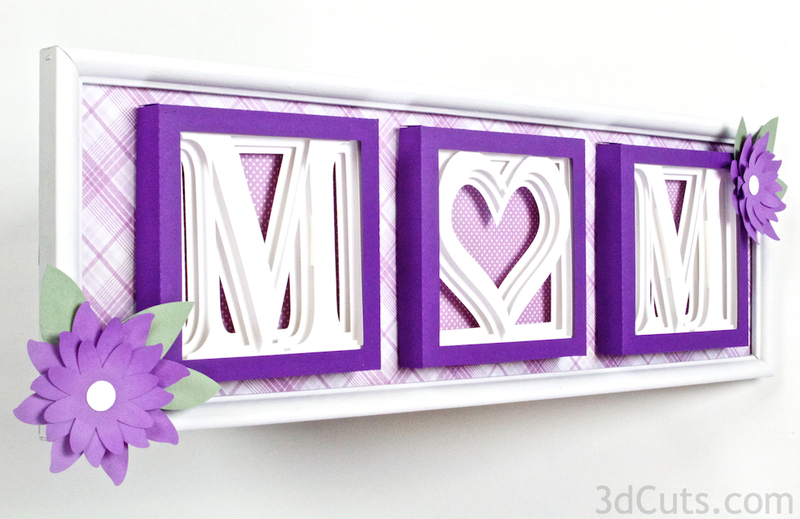 I used the heart shape to replace the "o" in Mom but also added a few paper flowers in coordinating colors as well. This idea applies to both horizontal and vertical arrangements. There are thousands of cut paper flower designs available in the cutting file world but I have added this one to the MOM word grouping file available here. I have just added numbers to the line. That opens up all kinds of projects with dates. Because I am introducing this in May, it is graduation season! How about adding a graduation cap? 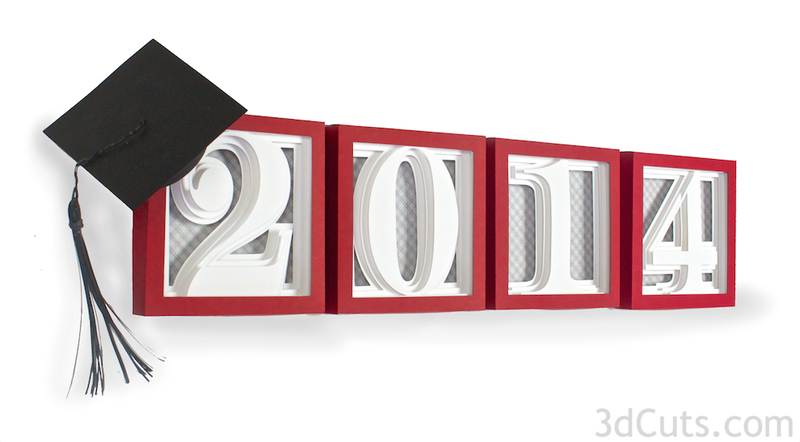 As a bonus, I've included the graduation cap in the complete numbers group as well. Here I grouped all the files together for the Ampersand File and scaled them down so the shadow box was approximately 3.5" square. I used that between initials for a classic monogram pairing. Everyone can add their own personality to these shadow boxes. Here are samples shared with me by other crafters from around the world. Courtney Lega has made many beautiful projects with the Alphabet and Numbers Shadow Boxes. She made the 5th grade at the right to be used in the photo on the first day of school for her son. Here is a different version of the HOME file. This one was completed by Sheila Lazier and she used the heart shadow box for the O, used a vehicle display and added a pop of color with some paper flowers and leaves. Collen Garcia used the number shadow boxes and added a generic wall clocks to make this functioning wall clock.